On Mind,the extremely fragrant Ylang-ylang oil assists with depression, anxiety and stress while having a calming and aphrodisiac effect on mind and body. On skin, ylang-ylang oil has a soothing effect and its balancing action sorts out over-dry as well as overly-oily skin by balancing the secretion of sebum. On Hair, the calming oil has a stimulating effect on the scalp which promotes more luxurious hair growth. 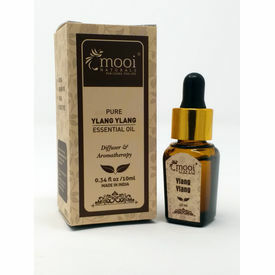 100% pure,steam distilled Ylang-ylang oil extracted from the freshly picked flowers of Cananga Odorata (Ylang Ylang) Essential OilOn Mind,the extremely fragrant Ylang-ylang oil assists with depression, anxiety and stress while having a calming and aphrodisiac effect on mind and body. On skin, ylang-ylang oil has a soothing effect and its balancing action sorts out over-dry as well as overly-oily skin by balancing the secretion of sebum.On Hair, the calming oil has a stimulating effect on the scalp which promotes more luxurious hair growth.